I just went through the process of pulling together a bunch of disparate gags, quotes, and story notes from a variety of sources. I still have to go through some files on my PC to complete the effort. Now, I follow the “carry a notebook” philosophy, so that I can always write down ideas or scribblin’s when they come to me. I stole a pen cap from a ballpoint to protect my mechanical pencil nib, so that’s easy enough to carry. The kicker is the notebook: to be pocket size, it has to be small, but because it’s small, I’m forever having to jot my ideas down on Post-its, paper scraps, and whatever else may be around when the notebook is full (or, god forbid, absent). My phone of choice is a “smart phone” with a touch screen, so I can also jot notes directly into it, and it is pretty ubiquitous, but its fidelity is nowhere near as fine as pencil and paper, so I’ve found it not to be my preference. So, the question: How do you other creative types keep your thoughts in order, and, more importantly, available enough that you can put ‘em to use easily when it’s time to draw from the old idea archive? Monday’s mega-strip marked the end of the longest storyline I’ve done to date in Odori Park. Thanks to all of you who came along with me over the past two+ months through this extended flashback. Now that it’s over, I’m keen to hear what your reactions are to such a long story arc. As a whole, did you enjoy it? Did you miss certain characters who didn’t take part, or love/hate new ones I introduced? Did you think it was overlong, just right, or that it ended too soon? I hope you’ve been leaving me comments or sending me notes–I’d love to hear what you think about these Minicasts–and in the meantime, I’m busy working up Monday’s comic. Hooray! 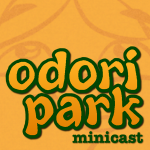 I intend to post new Minicast episodes from here on out at a rate of one a week, although I haven’t settled on the day. Maybe Friday makes sense! Or Thursday. Because Thursday’s lonely, and wants attention.